The German leader failed to endorse NATO membership for Georgia and was reluctant to use the term “occupation” to describe the situation in the breakaway territories. German Chancellor Angela Merkel's visit to Georgia left many Georgians disappointed by her perceived lack of commitment to the country's NATO aspirations and for reintegrating the two Russia-backed breakaway territories back into the Georgian fold. 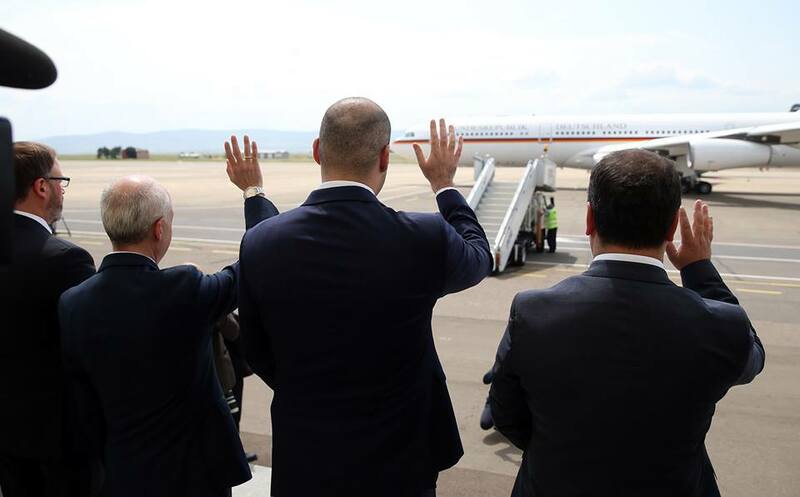 Merkel's visit, her first since 2008, was the highest-profile trip by a Western leader to Tbilisi in several years. But Georgians, eager for Western support in their ongoing struggle with Russia, were nonplussed by some of Merkel's comments. During her two-day visit, Merkel also conspicuously shunned the term “occupation” to describe the current situation, in which thousands of Russian troops are deployed in Abkhazia and South Ossetia, and instead described the situation as “unfair.” She did visit a segment of the de facto border, a Russian-policed perimeter that Georgia calls an “occupation line,” and peeped into breakaway South Ossetia through binoculars. But she described the dividing boundary as “demarcation line,” a novel formulation that seemed a bit too cold to many Georgian observers. Begegnungen an der Verwaltungslinie zu Südossetien: Kanzlerin Merkel spricht mit Anwohnern und besucht die europäische Beobachtungsmission EUMM, die sich für ein friedliches Zusammenleben in der Konfliktregion engagiert. --- At the region of South Ossetia: Chancellor Merkel speaks with local residents and visits the European observation mission EUMM, which ensures a peaceful coexistence in the conflict region. Merkel was later challenged on her reluctance to say “occupation,” and Merkel relented. “Do you have a problem with the term occupation? Why don’t you use it?” one student asked during Merkel’s university visit. “Yes, this is occupation,” Merkel concurred. She said that Germany “does everything” to support Georgia's territorial integrity, but her comments suggested that she did not explicitly raise the issue of Georgia with Russian President Vladimir Putin during their closed-door meeting on August 18. But “he knows my position,” she said. She did discuss Ukraine with Putin and came out more strongly discussing the situation in Ukraine, which is also struggling with a Russia-backed separatist movement. Pragmatic considerations appear to prevent Berlin from pressing too heavily on Moscow, Merkel suggested in Tbilisi. “Germany can’t afford to say no to cooperation with Russia on oil and gas,” she said. Critics, including U.S. President Donald Trump, argue that heavy dependence on energy imports from Russia – Germany gets between 60 to 70 percent of its gas from Russia – keep German foreign policy hostage to Moscow. Merkel pointed out that Russian gas is cheaper than alternative supplies from Georgia’s neighbor, Azerbaijan. Merkel softened the blow of her statements on NATO and Russia by offering to design a quota-based program of employment for Georgians in Germany and by playing down German concerns over a rise in illegal migrants from Georgia in the wake of the abolition of short-term visas for Georgians visiting the European Union. Georgian criticism was directed mainly against their own government rather than Merkel, with analysts and opposition politicians arguing that Tbilisi is not doing enough to secure active German support for Georgia’s main policy goals, NATO membership and territorial integrity. Sergi Kapanadze, a member of the opposition European Georgia party, said that Merkel’s positions on Georgia are a result of “inexperience” on the part of new Prime Minister Mamuka Bakhtadze’s and the government's broader policy of making sure Georgia is not an irritant in ties between Russia and the West. Georgian Foreign Minister Davit Zalkaliani dismissed the criticism, saying that Georgia is making “significant progress” toward Euro-Atlantic integration. **Initially this article incorrectly identified former defense minister Davit Sikharulidze as Giorgi.